Widespread parts of the Adelaide Hills and metropolitan area have been shaken by an earth tremor, with one radio listener describing it as "like a train coming through the house". The quake reached a magnitude 3.2 about 8:30pm, with an epicentre near the township of Palmer, north-west of Mannum, according to Geoscience Australia. ABC Radio Adelaide listeners inundated the station's switchboard with reports of the tremor from as far afield as the Barossa Valley, throughout the hills and into the southern suburbs. "I was just lying in bed reading a book and I felt the whole room tremble," Andrew from Hahndorf said. "The cat shot under the bed and hasn't come out yet. "This one seemed a bit like a train coming through the house." 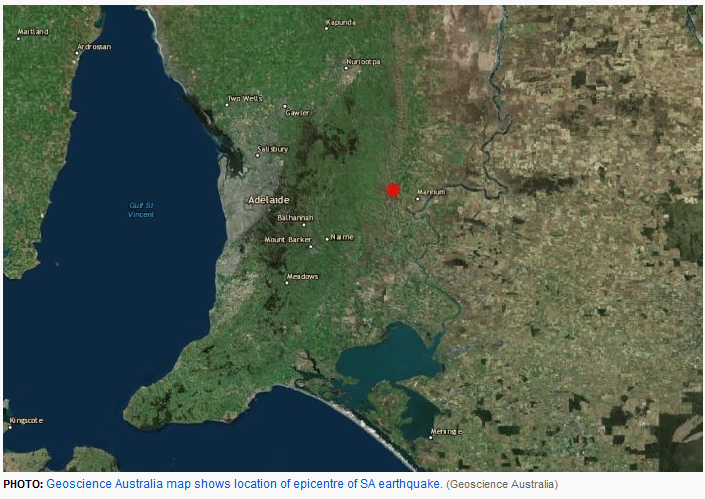 The tremor was recorded at a depth of 13 kilometres, Geoscience Australia said. Other listeners reported the tremor lasted about 10 seconds, and rattled windows and shook the floor. Senior seismologist David Love said there was a chance of small aftershocks. "I felt the windows of my house shake in Payneham," he said. "We wondered quite what it was. It was just a gentle rattling of windows, no sound of any plane or anything, and I thought 'oh it's going on a bit long for an earthquake'." Earthquakes are not unusual throughout the Mt Lofty Ranges and the Flinders Ranges. In May, a magnitude 3.0 quake hit Mount Compass on the Fleurieu Peninsula.